Are your students struggling in writing? This easy and painless way of teaching writing will have you doing the happy dance. It is a teacher-friendly program with a step-by-step design for scaffolding and engaging students. You will have students BEGGING to write and see them shine on a standardized writing test! This concept works well with any writing curriculum. I will explain my theory for you to use in your classroom FREE of charge and if you don’t want the hassle of creating your own lessons, then you can click the NO-PREP program with everything included below. What strategy is most effective in teaching writing? If I can share one highly effective strategy, it would be scaffolding. When you teach students to write step-by-step, they will see their writing evolve and you will all have an ah-ha moment together. I know it can be frustrating to work on one piece of writing for an extended period of time, but the end results will have you doing the happy dance! Give your students a writing prompt and follow the STEPS below for that particular type of writing. Work on the same prompt through each of the steps. It will take you through the writing process in an order that makes the most sense and it will help students remember the components needed for an effective final copy. 1. Step-by-step lesson plans for how to set up interactive notebooks, sentence writing, paragraph writing, narrative writing, opinion or argumentative writing, and informative writing. 2. For each mini-lesson, there is a teaching poster or anchor chart, interactive student page, and examples of model writing. Some lessons also include fun, motivational ideas, student practice pages, and assessments. 3. Forms and Posters: writing workshop rules, mentor text lists, writing process posters, tracking forms, checklists, goal forms, notebook check forms, rubrics and more. 4. Student Resources: Million Dollar Dictionary, spelling dictionary, student resource booklet, portfolio labels, and more. 5. Homework/Classwork Prompts with day-by-day student directions and rubrics. What does a year of this program look like? First of all, be ready to start with a positive attitude! If your students see you excited, then they will be curious and want to jump right in on the excitement! (Subjects, Predicates, Fragments, Complete Sentences, Run-Ons, Compound Sentences) – Assess progress and have students record their scores on a tracking form. (Topic Sentences, Relevant Details, Clinchers, Hamburger Model) – Assess their progress and have students record their scores on a tracking form. What are D.A.R.E. and C.U.P.S.? The following posters are free in my store. There is also primary version! The rest of the lessons follow this 6-Step Writing Process. It is important to teach all of the mini-lessons with the first writing prompt. It will take several weeks to write this first essay, but it will be worth it in the end! If your district is adamant about starting with Opinion Writing, that is ok! This program is flexible. Although I found it easier to start with Narrative Writing (then build in the opinion and informative elements afterwards), you can start with any type of writing. First, start by introducing the prompt. Each day you will teach a mini-lesson. Provide a poster or anchor chart for students to see that skill. Share a mentor text and model each skill by writing a class essay. Then students take what they learned and apply it to their own writing for the prompt. Only allow students to work on that particular lesson for their story. Many students want to hurry and finish, but don’t let them move on! I recommend staying in this order so there won’t be confusion in later lessons. a. Narrative Elements-Hand out a checklist! n. Add (Million Dollar Words)-can also use with exchange. 1. Students should add the notes to their writing notebooks using interactive pages. If you are short for time, you can skip the interactive part of the lesson. Although it can be timely, interactive notebooks have proven to be a motivational tool! 3. 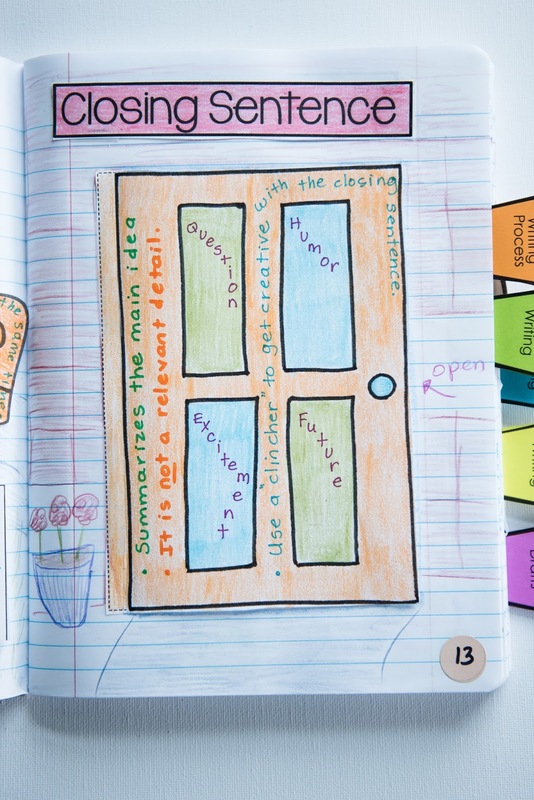 Students should then brainstorm ideas for their story using the mini-lesson and add the ideas to their notebooks. Allow them to collaborate in groups. 4. Students will add these ideas to their graphic organizer and/or rough draft depending on the lesson. 5. Lastly, share some student examples with the class. Have students take ownership of their learning by tracking their progress! After you grade their writing with a 3-point, 4-point, or 5-point rubric of the individual mini-lessons, then have students record it on a tracking form. After that they should create a goal for the next assignment! Once you start the second essay, some of the mini-lessons won’t take as long. They will be review or a different spin will be added for the new type of writing. As for C.U.P.S., only go back and review the lessons that your students need more practice. a. Opinion or Argumentative Elements-Hand out a checklist! s. Peer Reflection-make sure the peer looks at the goals set for this writing! Have students review their goals and track their progress! Then create a new goal for the next writing piece! a. Informative Elements-Hand out a checklist! u. Peer Reflection-make sure the peer looks at the goals set for this writing! Students should review their goals and track their progress! I hope this helps you find a way to engage and motivate students to write! Be ready to see your students excited about writing and PASS THAT TEST with flying colors!